Back on home turf at Newtown Community Market last Saturday the G.O. and I met a group of fox rescue people. I was immediately intrigued since as a little kid I encountered story book Foxy Loxy of Henny Penny notoriety and the real version on my grandparents’ farm – somewhat unwelcomed by the grown-ups as we had chooks, I’ve been fond of them. Many years ago, at my ex-in-laws the resident farm fox would come some evenings to accept a meal of raw meat bones, and romp on the lawn with their very timid Maltese Terrier. 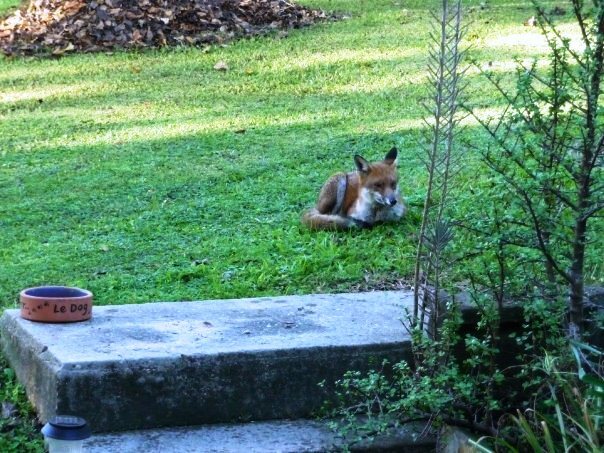 And, not so long ago one of the local fox population at Taylors Arm having exhausted as a food source the village’s entire complement of poultry made friends with the human residents, becoming quite familiar with its benefactors and welcome of a meal. This entry was posted in Blog and tagged animal rescue, Australia, family history, foxes, my life, Sydney Fox Rescue.